Injuries resulting from a catastrophic car accident can be devastating. Victims of rollover crashes, head-on collisions, crashes with commercial semi-trucks and motorcycle accidents can suffer serious injuries that change their lives forever. When a crash victim’s spinal cord is damaged, he may never walk again. As personal injury attorneys in the Dallas-Fort Worth area, we take on these challenging cases and fight hard to ensure our clients get the settlement they will need for a lifetime of care. According to the National Spinal Cord Injury Statistical Center, motor vehicle accidents are the leading cause of spinal cord injuries. Nearly 40% of the 17,000 spinal cord injuries that occur each year are caused by car, truck, motorcycle and pedestrian crashes. The impact of such a collision can crush, compress, dislocate or fracture one or more of the vertebrae that protects the spinal cord, damaging sensitive nerve fibers. In the weeks following a violent crash, swelling, bleeding and fluid build-up around the spinal cord can cause further damage. 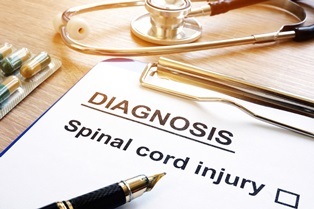 The full extent of a car accident spinal cord injury may not be known for weeks after an accident, and extensive medical treatment must begin immediately to try to control the damage. Cervical. The cervical portion of the spine is at the very top and includes the head and neck. The closer to the brain the spinal cord injury occurs, the more severe the damage will be. An injury to the cervical spine can result in paralysis of the arms, legs and trunk and can affect breathing, speech and bladder and bowel control. When a cervical spine injury causes tetraplegia, the victim has no feeling or motor control below the neck and will need assistance to breathe, eat, communicate and get around. Thoracic. The 12 vertebrae in the thoracic region are located in the upper back. Injury to this area can result in paralysis of the legs and compromised functioning of the diaphragm, bowel and bladder. Paraplegia is a common result of a thoracic spinal injury, leaving a victim wheelchair-bound and in need of assistance. Lumbar. Located in the lower back, the lumbar region controls functioning in the hips and legs. Damage to this area can result in loss of control of the bowels and bladder and paralysis of the legs, but victims can often adapt to manage on their own, usually in a wheelchair. Sacral. The sacral region is at the very bottom of the spine. While damage to this area is fairly uncommon, it can lead to difficulty walking, but usually not complete paralysis, as well as some loss of bladder and bowel control. Complete. Paraplegia and tetraplegia are possible results of complete spinal cord injuries. With a complete injury, permanent spinal cord damage has happened, and there is little hope of recovery. Incomplete. With an incomplete injury, the victim has only suffered partial damage to the spinal cord. There may be some hope of recovery, and the patient may still have some feeling and motor control of the affected areas. Your doctor will provide a complete picture of the kind of injury and the extent of damage you are facing following your car accident. When these injuries were caused by the negligence or carelessness of another driver, he must be held accountable for these extraordinary costs. Almost any attorney in Texas would be happy to take your catastrophic injury case because potential damages are significant. However, you want to find a personal injury attorney who has successfully handled many of these types of cases and who understands what you are going through. Don’t trust just any attorney with your spinal cord injury accident case. Contact Parker Law Firm to learn more about how we can help.